This canzona is among the finest in the collection. Perhaps in response to the special qualities of the 9th mode, it contains a great variety of themes (most of the canzona clichés appear at some point), and these are treated on a broad scale with masterly freedom. The three choirs engage in unpredictable dialogue—the opening two phrases are already irregular, two and three bars long respectively—and also digress into internal discussions, forming pairs and trios. There seems to be a teasing humour, in the uncertainty of the length of sequences, the whimsical syncopations within the uninterrupted duple metre, the expectations created then frustrated. There is no tripla and no recapitulation, yet the lively falling theme of the final bars is a perfect reply to the questioning dialogue of the opening. 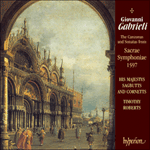 This, of all the varied works in the 1597 collection, perhaps shows most fully how sophisticated Gabrieli’s instrumental language had become.